Typical Application Schematic (a) Buck, (b) Buck-Boost. The LYTSwitch-0 family is specifically designed for low cost LED bulb and T8 tube applications. LYTSwitch-0 devices monolithically integrate a 700 V power MOSFET, oscillator, ON/OFF controller scheme, EMI reduction and control functions including cycle-by-cycle current limit and thermal shutdown circuitry into one IC. The LYTSwitch-0 family enables low component-count, non-isolated switching topologies for highly cost competitive LED lighting applications. 66 kHz operation together with frequency jittering insures a very low EMI filter cost. Start-up and operating power are derived directly from the voltage on the DRAIN pin, eliminating the need for a bias supply and associated circuitry. The LYTSwitch-0 family enables designs that easily meet European and North American standards for PFC in consumer lighting applications. Accurate CC with tight line and load regulation that is stable over a wide temperature range makes the LYTSwitch-0 ideal for LED lighting applications. Integrated auto-restart for short-circuit, open-circuit and open loop faults as well as a hysteretic over temperature protection feature (135 °C) provide extensive protection at no additional cost. 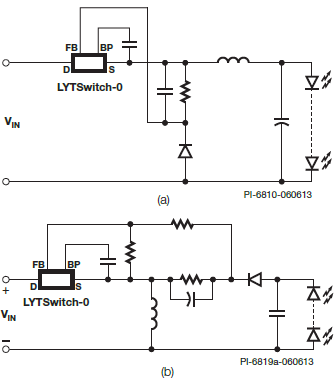 Buck, buck-boost non-isolated flyback, and boost architectures are all supported by the LYTSwitch-0 family. 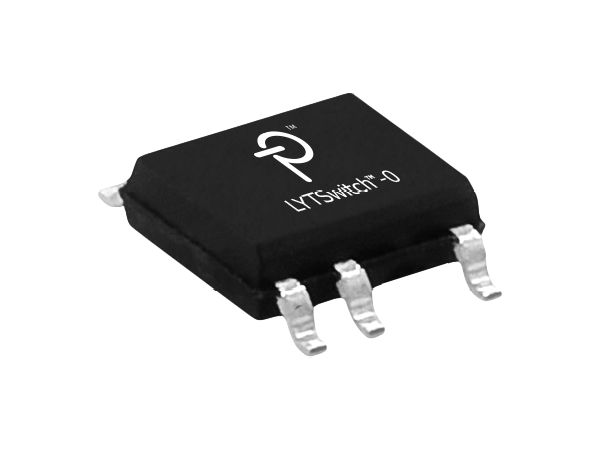 The 700 V switching power MOSFET supports an input voltage range of 85 VAC to 308 VAC. Package options for thru-hole and surface-mount suit different manufacturing requirements. Typical output current in a non-isolated buck converter. Output power capability depends on output voltage. See Key Applications Considerations section for complete description of assumptions. MDCM - Mostly-discontinuous conduction mode. CCM - Continuous conduction mode. PF high: >0.7 @ 120 VAC and >0.5 @ 230 VAC. PF low: for non-PF application where CIN >5 µF minimum. Packages: D: SO-8C, P: DIP-8B.